First Line: They found the corpse on the eighth of July just after three o'clock in the afternoon. Three months later, Martin Beck knows two things: the victim's name was Roseanna, and that she could've been strangled by any one of the eighty-five other passengers on the cruise to Sweden's beautiful Lake Vattern. But this Detective Inspector with the Swedish National Police does not give up. He keeps piecing together bits of information about Roseanna, and he is continually narrowing the list of suspects. Will Martin Beck find justice for this young murdered woman? Will he be able to stop a very clever murderer from doing it again? Sooner or later, anyone who loves reading crime fiction will run across the names of Maj Sjöwall and Per Wahlöö. Their books have been recommended to me countless times, and I finally decided that I'd pull Roseanna off the shelf and read it. I wanted to know why the ten Martin Beck mysteries they wrote between 1965 and 1975 are considered to be among the finest ever written in any language. Now I do. The detailed accounting they give of Beck's work is low on word count and high on facts. There is not one wasted word to be found, and as I read, I smiled. I could hear a little Jack Webb voice muttering "Just the facts, ma'am" in my head. All the police work that's done is shared with the reader-- and it's brilliant. Originally published in 1965, all the work done during the course of the investigation is pre-computer, before all the electronic gizmos that we depend on today. By seeing all the work being done, by watching the facts and evidence begin to pile up, by listening to the detectives talk amongst themselves sharing thoughts and ideas, the reader can really get a feel for how the case proceeds. Time is one of the most important characters in Roseanna. Seasons change. The reader is told how many days it takes for translations to be done and for evidence to be gathered from tourists who have returned to their homes around the world. We see how a stakeout is planned and carried out. The time involved is always logged. There's a stopwatch ticking away, and we are never allowed to forget it. While the investigation is being carried out, we also learn about the melancholic Inspector Beck with the iffy stomach, who obsesses about finding the killer of this young free spirit, and who can't stop mourning the fact that he and his wife have grown apart over the years. Arguments with the spouse? Chronically upset stomach? Dismal days of rain? Everything that's disagreeable just gets plowed under as Beck focuses on his case load... and on a young woman he simply cannot forget. I now see why Maj Sjöwall and Per Wahlöö are considered by many to be the masters of crime fiction. Roseanna is a brilliant and hypnotic piece of work that refuses to turn loose of a reader's mind. From the very beginning, the momentum slowly gathers like snowfall in the mountains until Martin Beck recognizes the killer... and the avalanche begins. 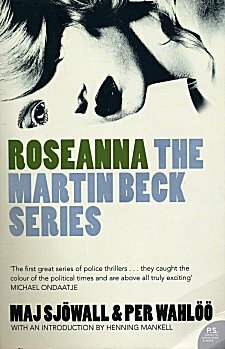 Cathy - I consider the Martin Beck series to be one of the few series I think every crime fiction fan should read. It's that good. it's that well-written. Roseanna is an excellent start to it, and the series simply doesn't let up. It stays brilliant in every book. I'm a believer now, Margot. The proof is in the reading! Absolutely, and you have nine more excellent books to read by the grandparents of Scandinavian crime fiction -- perfect investigations with some social criticism carefully inserted. Sjowall and Wahloo's books are taught in college classes now about mystery writing. I'm reading Richard Galbraith/J.K. Rowling's Cuckoo's Calling. It's a well-written book, but 454 pages and has so many details I feel like editing it. However, it's not written as a suspenseful mystery with clues and puzzles and teasing points at the end of chapters. It's a novel with a death in it. But it's very good, and will take me days to finish. So, to read a Camilleri, or another shorter book is essential between tomes. Also, I'm reminded I have three more to go in the Beck series, a treat. I meant to say that Sjowall and Wahloo showed that a good mystery can be under 300 pages.